President Pranab Mukherjee on Thursday (Nov. 05, 2015) launched IMPRINT India – a single window funding clearance mechanism to get Indian technical institutions to conduct original research in areas where the country is heavily dependent on foreign technology. Prime Minister Narendra Modi, HRD minister Smriti Irani along with senior ministers and prominent academicians were also present during the launch at Rashtrapati Bhawan. ‘IMPRINT’ is the one stop research funding mechanism to boost indigenous technology and research and a Pan-IIT and IISc joint initiative to develop a roadmap for research to solve major engineering and technology challenges. Speaking on the occasion President Pranab Mukherjee said the new education policy must alter the dynamics of education sector. 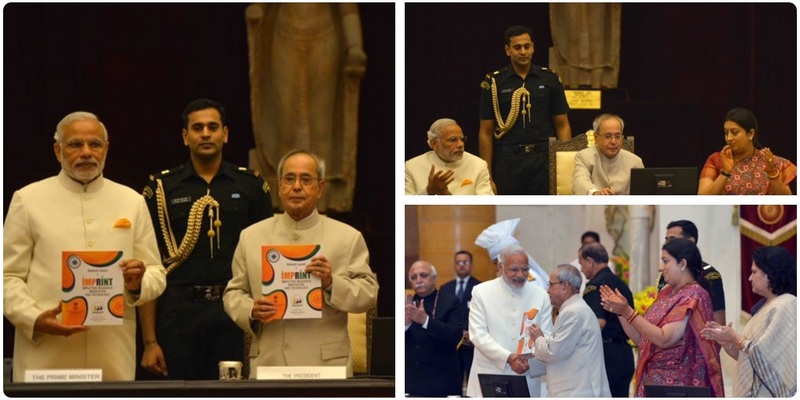 PM Narendra Modi during the function said that IMPRINT India will give a roadmap for the development of country. Talking about sustainable technology, the Prime Minister said Society is becoming technology driven and It is essential to understand the importance of this and look towards affordable technology. Minister of Human Resource Development Smriti Irani said that govt’s national institutional ranking system will help students to take an informed choices in the future. The full video of the launch function is made available by Doordarshan here.